Coffee Tickle: Coffee Cufflinks...Just nice! - Coffee News | Coffee Blog | Coffee Mugs | Coffee Videos | Coffee Art | Coffee Reviews Coffee Tickle: Coffee Cufflinks...Just nice! Check out these coffee cufflinks (Vintage Coffee Cufflinks and Greek Coffee Cufflinks ) and have a more confident(we hope so) day. With a nice shirt, your coffee cufflinks and a cup or two of coffee then you're all set to go. People will notice you more and hopefully your boss gives you a promotion. OK...stop with the sales talk.. I've never been a cufflinks type of person since I only have a pair but obviously I am a coffee person. When I saw these cufflinks, I just wanted to get them and show it to everyone. The only problem is that I seldom wear a dress shirt unless, I'd literally use it as a decorative in my room. 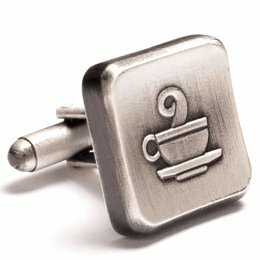 But coffee cufflinks with a nice dress shirt is just a nice combination to have. Those are pretty neat. I'm grateful to work in a business casual environment, but it would be cool to occasionally have cause to wear cuff links like that. I have the ceramic full size version of the Greek coffee cups. I don't know how many of the paper ones I went through when I lived in NYC.